I felt this beautiful piece of art depicted perfectly the theme for this episode’s class. The piece is by Artist Christopher Beikmann. The art is available as a giclee on hand stretched canvas 48″w x 24″H a limited edition of 5 . You find out more about Chris and his artwork (and SHOP!) at www.AncientArtiZen.com. Yoga Lesson: How do we tune into nature and allow it to deepen our life? Every day I am brought to back to the application of yoga lessons in my life. Yoga or life as I choose to see it now, becomes a pulsating beneficent opportunity, a gift really, for me to become a better human being. This past week I was given the task of preparing one of my current students to step into an Anusara Immersion with my beloved teachers that has already started. She missed the first weekend, or half of Part 1. My job is to catch her up *gulp*. Out have come all of my notes and of course the Immersion Lesson plans and the like. Succinctly explaining the Anusara Philosophy, the 3 As and the UPAs (Universal Principles of Alignment ™) is not the easiest thing when you have crazy time constraints. Arghhh!! !…goodness gracious! So given that, studentship has been on my mind. I am stepping into the seat of the student as I pour over how to convey all this knowledge in a way that will be optimally soaked in by her. I adore the way that I heard John explain studentship using the Elements. I remember how he shared that using the elements as teaching tools is wonderful because they are understood and experienced by all, so we have a common ground from which to step into the teachings and also deepen the understanding of the UPAs within the yoga postures. Since I’d been meditating on this theme, lo and behold, I taught all about it! This episode’s online yoga class is a Level 1.5 class (in other words strong). It’s slow, meditative and we take time to get into things. I hope you enjoy stepping into it! In my intro I told you that I recorded 2 other classes that I was unable to use for the podcast, but I’m making them available to you, if you would like to download them. Both of them are level 2 yoga classes. One of them is a full 80 minute class with less than optimal audio, and the other one was a TOTALLY awesome class, but I ran out of batteries half way through the class! Ugh! I have to be very honest, winter is very challenging for me. I do my best to see all the goodness, I really do, but when winter begins, man does it kick my spiritual booty! I’m getting more and more adept at allowing nature to guide me into what I teach. This generally happens during my walk to teach my yoga class. I’ve learned to let go of ‘what I have to do’ and simply allow myself to listen and to drink inspiration freely. Thank God for Christmas lights! They were so beautiful! They showed me things I hadn’t seen in a while, streets that I walk often shifted and shone in a different way. I was more intrigued by what was going inside the homes that the outside. 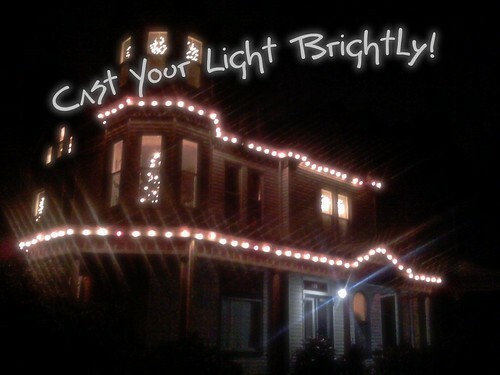 I saw beautifully decorated houses whose windows shone so bright. I saw shapes and figures all inviting me to step deeper into the homes, into the warmth of the inner dwelling. I realized that the holiday lights where put there in a very strategic way, they weren’t just randomly placed, they weren’t merely thrown out, but carefully thought out and generally speaking, placed in ways that would enhance each individual dwelling. The specificity of the way the light was cast out was a clear reflection of the owners time, thought and commitment. I saw that in order to place these lights optimally the dweller must first be willing to search the closets, the basements, the attics, to get the boxes out and choose what to cast out. What makes this so glorious is that all this beauty wouldn’t be seen if it wasn’t for the shorter and darker days of winter. The winter serves to take us deeper into the closet of the self so that we may bring out the decorations of light and enhance the world around us by the way in which we choose to cast our own individual light out into the world. The nature of the universe is how you choose to pour the light of consciousness into the dwelling place of the self. As you do this oh how it shines brightly all around, showing off those mighty beautiful lights. How do you choose to create a dwelling place of light? My teacher John guided me to recognize how one truly begins to know something. How do we acquire knowledge? Deep knowledge? How do we align with anything? You soften, feel and attune. We attune to the Highest. We attune by getting close to that which we wish to know. This learning is not a head thing, but a heart thing as we truly begin to ‘vibe’ with and resonate with each other at a much deeper level 😀 Listen and practice to the class and see if you can begin to attune to something bigger! Elsie’s Yoga Kula on Facebook Join us!